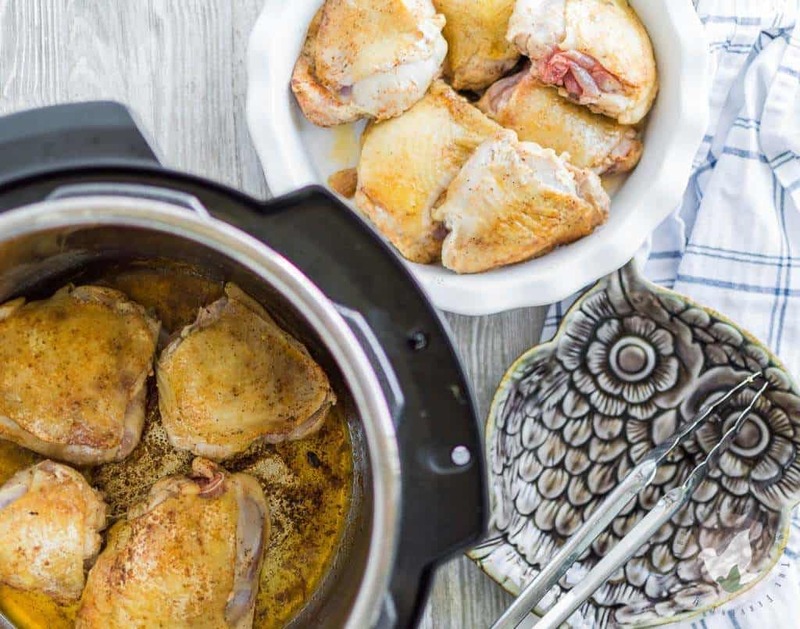 It’s been quite a little while since I shared one of my own Instant Pot recipes! We’ve been so busy around here that I’ve just seemed to drop off sharing recipes and focusing on new things here on the blog. In fact, the last recipe I shared was our Pressure Cooker Cream cheese that was all the way back in OCTOBER. I’m slacking guys. 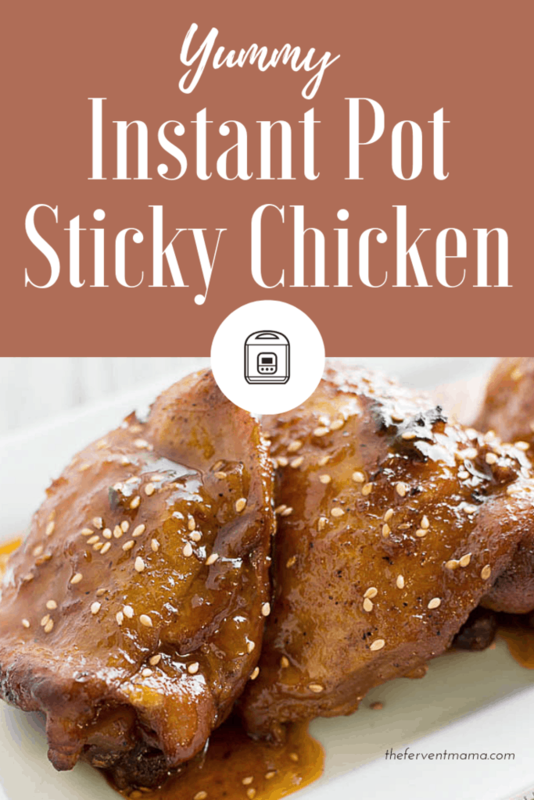 But, you’ll be happy that my first recipe back is this Instant Pot Sticky Chicken! I made this recipe on a whim and man it was sooooo delicious. While I was prepping supper sides, I was snagging sticky bits that got stuck to the foil during broiling and I couldn’t wait to sit down with a full plate of this yummy goodness. 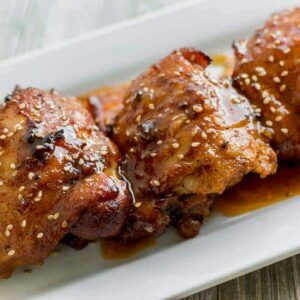 I’ve made plenty of versions of honey garlic chicken, and while I do have a special place in my heart it, this Instant Pot Sticky Chicken takes the cake! We’re from the South, and we ain’t no fancy schmancy chefs here. It isn’t very often, if at all, that you’ll find recipes here that include one-time ingredients or things that you don’t already have in your pantry. Because, ain’t nobody got time to be gathering all these special ingredients, only for them to go to waste before you get to use them again. Creating yummy, family-friendly food can be simple. This simple. Be aware, this recipe does not create a nice, crispy chicken skin, if that’s something you’re into. I mean, I am. But, as Christopher Kimball recently said on Milk Street, “it’s not always needed, so just get over it“. Here, the purpose of the chicken skin is purely to keep our chicken protected, and juicy, during all that cooking time. And don’t forget all of that extra flavor that comes from that chicken skin and bone! So, while I’m not naturally a wasteful creature, the chicken skin gets thrown out on this one. 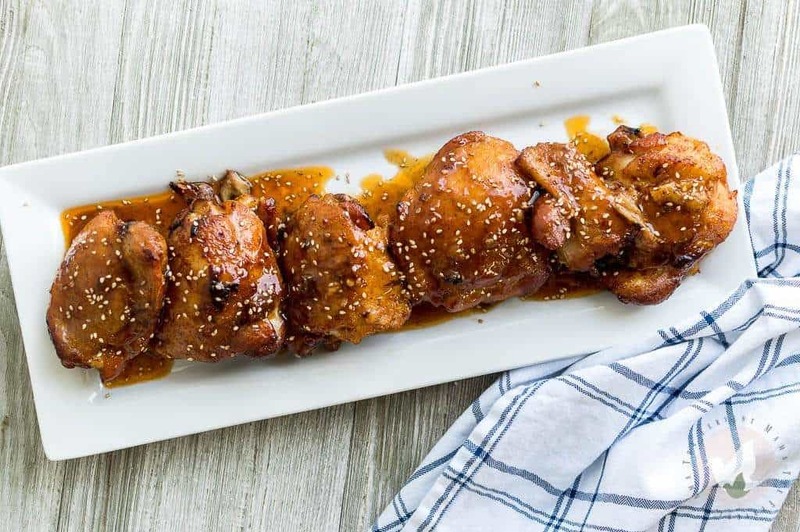 But can we just take a minute to appreciate how gorgeous this Instant Pot Sticky Chicken is? My mouth is literally watering writing this. My whole family agrees that this should be on your Menu Plan right now. I made this recipe on a whim, and man it's so good! 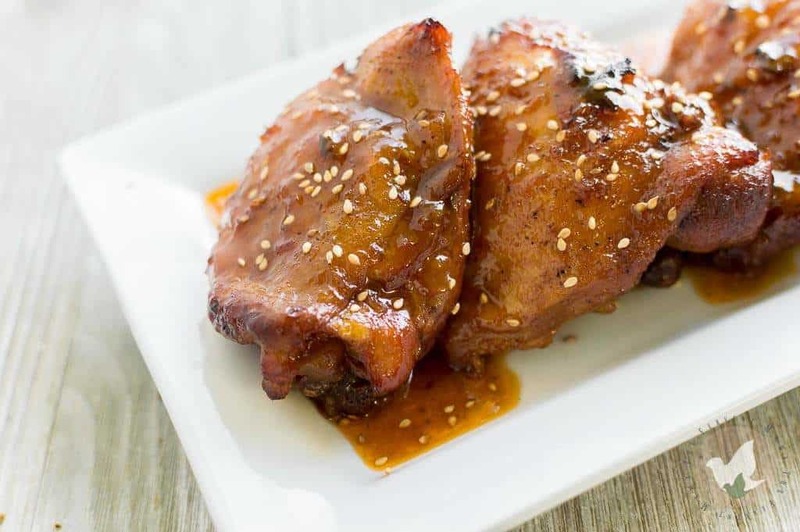 I've made plenty of versions of honey garlic chicken, and while I do have a special place in my heart it, this Instant Pot Sticky Chicken takes the cake! Turn your pressure cooker to the "Saute" mode and add your oil. Liberally season both sides of the chicken. 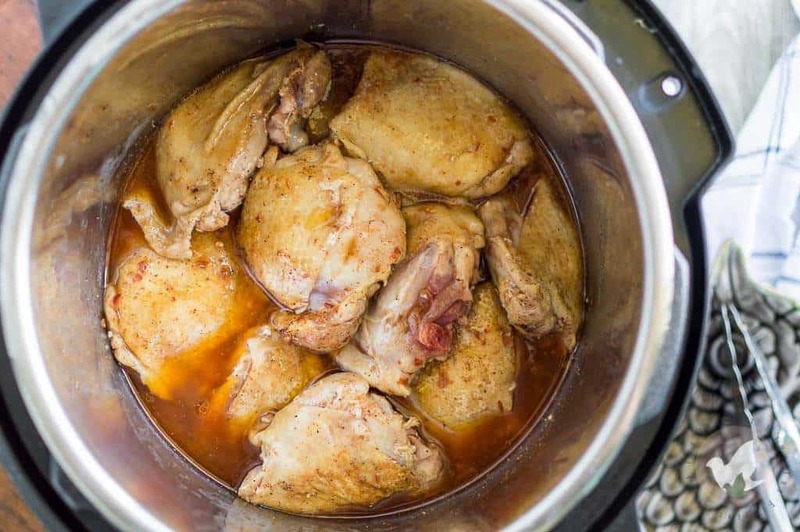 When the oil is hot and begins to shimmer, begin searing the chicken in batches (being careful not to overcrowd the pot) skin side down, 2-3 minutes per side. 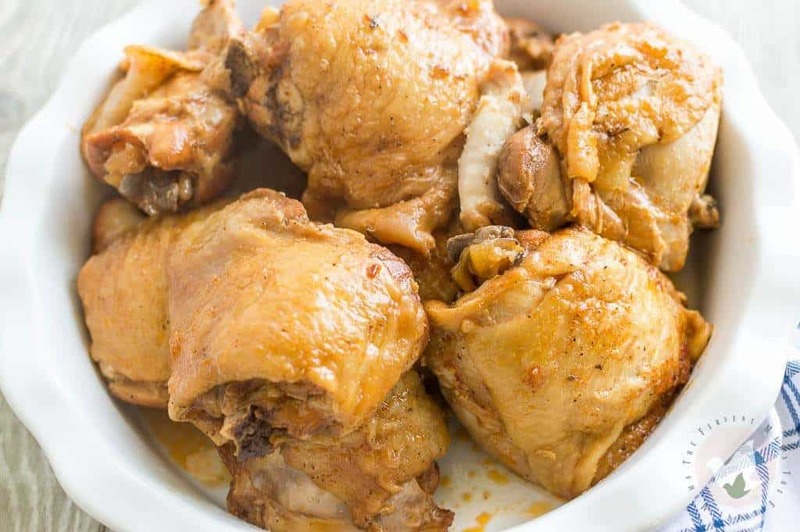 While the meat is searing, add chicken broth, chili garlic paste, minced garlic, ketchup, honey, salt, vinegar, and onion powder to a bowl and stir until combined. Set aside. When all chicken has been seared, place all chicken pieces back into the pot, skin side up. Pour over the chicken and stir gently until completely coated. Close and lock the lid, making sure that the vent is closed. Cook on HI pressure for 18 minutes. When the cook time has ended, let it natural release for 5 minutes, and then perform a quick release to let the remaining pressure out. The chicken should be cooked at this point, but not "sticky". The oven is going to be what helps us to obtain our delicious sticky-chicken. Line a baking sheet with foil and place your oven on HI broil. 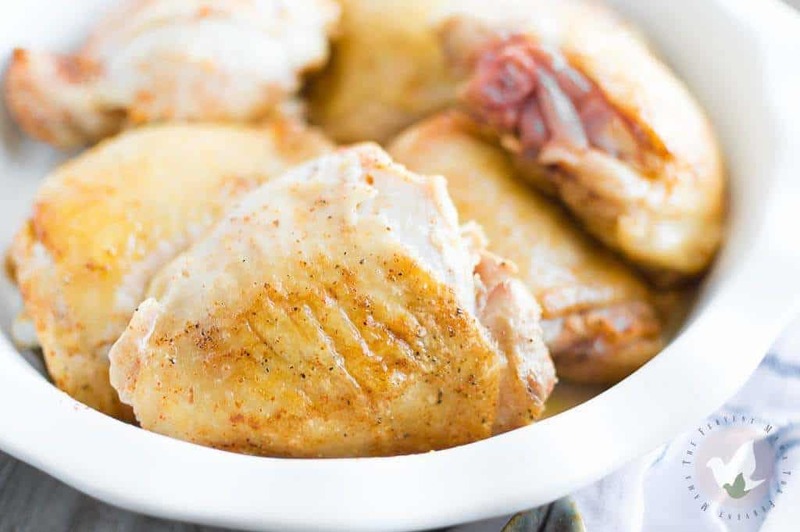 Take the chicken out of the pot and set aside. Turn the pot to "Saute" mode and reduce your sauce to half. Depending on your pressure cooker, this can take up to 15 minutes. In a sperate bowl, add corn starch + water and stir until dissolved. Add to sauce and stir until sauce becomes thick. About 1-2 minutes. Very carefully take each piece of chicken and dip each side in the sauce and then place on your lined baking sheet. 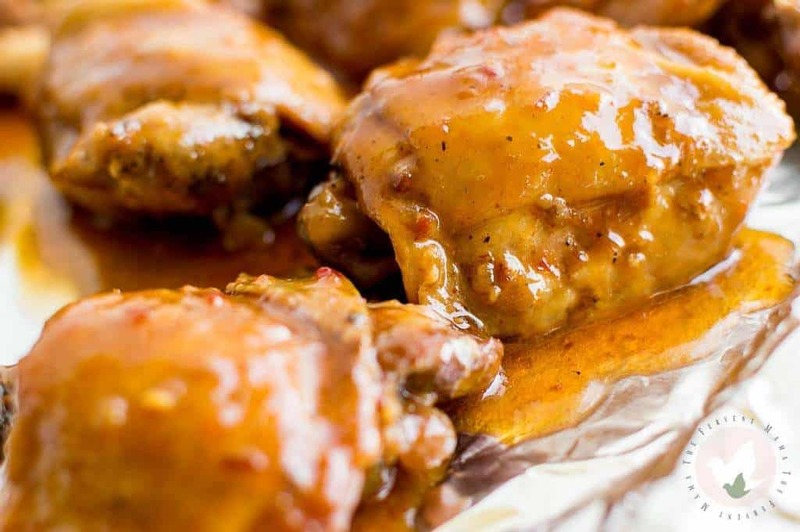 Broil for 3-5 minutes or until chicken becomes "sticky" and slightly glazed. Top with toasted sesame seeds and serve with remaining sauce for dipping! Enjoy! Don’t let the slightly longer list of instructions intimidate you. 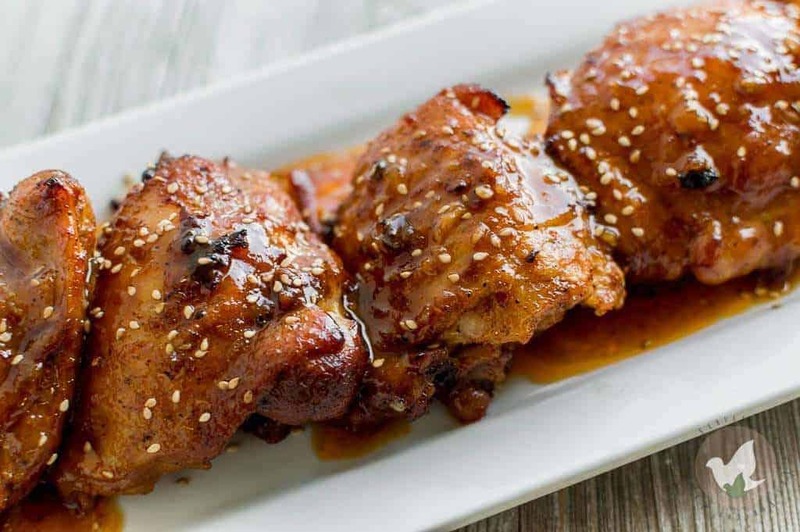 I wanted to be super detailed so that you can get the same lovely Instant Pot Sticky Chicken that we’re debuting. It really is simple, I promise! If we were to round it all up and tell you in just a few words what we’re doing, I could say “season, sear, pressure cook, broil”. I also have had those recipes where I followed the directions to a “T” and then looked at my food compared to those pretty blog and Pinterest pictures and was like “What the heck did I do?”. I’m a food blogger guys, if I can’t replicate a recipe based on instructions, then I’m a failed food blogger. Or does that make them failed food bloggers? Ugh. Who cares. You can do this. I believe in you. But anywho, if you’re looking for extra help, recipe ideas, or just fun little tidbits and community surrounding your Instant Pot- or other brand pressure cooker- you should join my Facebook group! I know you’re there most of the time anyways- head over to Facebook and get in on the Pressure Cooker Family Recipes fun! Don’t forget that I want to hear about your experiences with our recipes! Did your family love it? Did you change something up? We want to hear about it! So head back over here once you’ve crafted your own supper like a super-parent-chef, and tell us what you thought in the comments! !